Just who were that group of hooded figures in orange jumpsuits walking down Northcote Road this lunchtime? 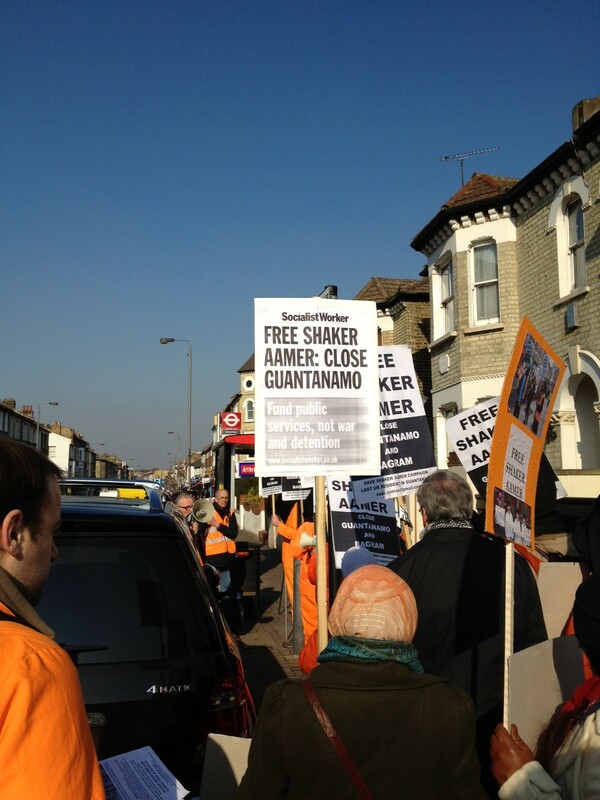 It was a protest to mark the 10th anniversary of Wandsworth resident Shaker Aamer imprisonment in Guantanamo Bay. He remains the last Londoner in Guantanamo, despite not being charged or tried for any crime. His wife and four children – one of whom he has never met – still live locally. 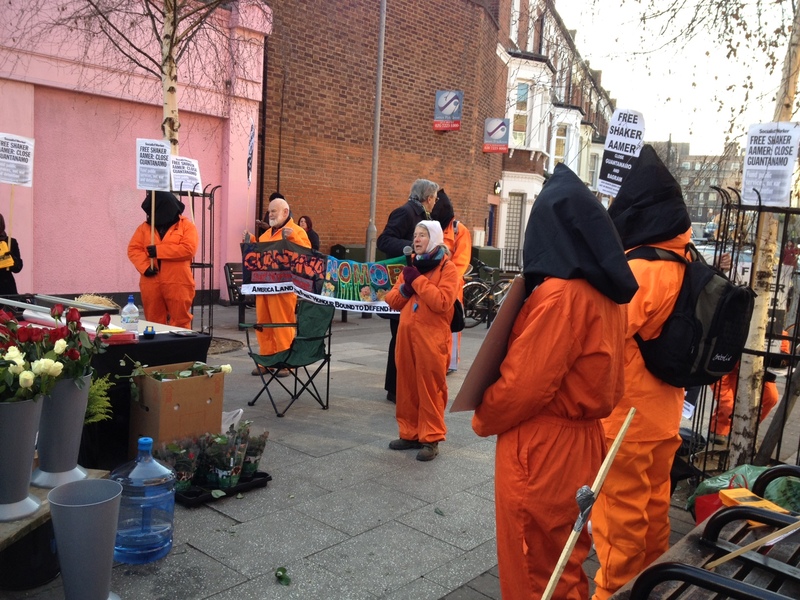 The march began on Northcote Road, turned up Lavender Hill and then along Falcon Road to Battersea Islamic Centre for a hot drinks, a rally and a screening of a new film about Guantanamo Bay. There were a few disparaging comments as we walked through the town centre (“Keep it open” and “Does that mean you support the Taliban?”). Mostly, residents seemed mildly shocked or amused at the sight. “Oh, it must be a Guantanamo thing” one man told his girlfriend. Several residents, including a Conservative councillor, asked for leaflets as we walked by. One young man ran out of a coffee shop to learn more. “We are here today to remind you that Shaker Aamer has been in Guantanamo for 10 years. On Tuesday we will be outside the American embassy to say it is an absolute outrage that Shaker Aamer, a British resident is still in Guantanamo. “We have a message for the UK Government, don’t just ask for his release, don’t just request his release, demand his release. Insist on the release of a British resident who has done no wrong. 10 years of torture and abuse. We want the British government to get off its knees and get Shaker back. I said a few words about human rights, you can read them at the foot of this post. To can find out more about Shaker Aamer’s case see the Repeive website. Please contact me if you would like to be involved in the Save Shaker Aamer Campaign. Thank you all very much for being here. I’d like to thank the Save Shaker Aamer Campaign for their tireless work – often in the face of official obstruction and against the odds. I am a local Labour councillor and I am pleased Jane Ellison is here as she has continued the work that Martin Linton began; MPs for Battersea from different parties but with the same commitment to this cause. Because this is not about politics. It’s about the rights we all share. Dignity of the individual is at the heart of our politics – and our religions. Shaker Aamer, like you or me, is innocent until proved guilty. He should be returned to his family because he been held for 10 years without any charge or trial. It is very difficult to believe in universal Human Rights – protection for each individual, no matter who they are, no matter what they have done. Many people walking down Northcote Road today will believe that rights have to be earned, and that they can be taken away. It is easy to give Human Rights to our friends, harder with a stranger, and hardest of all with our enemies. But there must be basic rights we all share simply because we are all human and we are all equal. Guantanamo has damaged the idea of basic individual rights – and has therefore made the world a more dangerous place, not a safer place. UPDATE Monday, February 13: The front page of today’s Independent features a story about Shaker Aamer: ‘Private letters raise fears for last Briton in Guantanamo’. This entry was posted in Uncategorized and tagged Clapham Junction, Guantanamo Bay, Shaker Aamer by Simon Hogg. Bookmark the permalink.